Top tour this week at the KEF Audio facilities in Maidstone at our exclusive look behind the scenes. KEF are industry leaders and have been at the forefront of loudspeaker design and technology for over fifty years. From custom installation speakers to multi award-winning home theatre systems and class-leading, Hi-Fi stereo speakers – they take sound seriously. 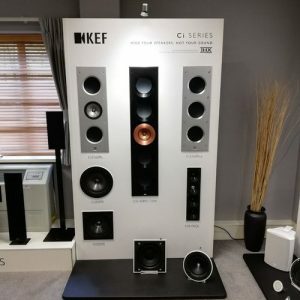 The tour gave our team and guests exclusive access to the KEF site, showcasing KEF’s established high-end audio range, with product insight and company history provided by KEF’s industry experts. Our team relished the opportunity to have a look around the production facilities and meet the highly-skilled technicians behind the hand-assembly of KEF’s flagship models. – The Reference Series; a range that needs little introduction, which has helped shape the KEF brand. – The Ci Series; a range of custom in-ceiling and in-wall speakers designed to provide flawless sound quality with discreet, space-saving installation options. – The BLADE Series and Muon stand-alone speakers; a range which truly pushes boundaries whilst delivering stunning, sophisticated sound combined with innovative aesthetics. 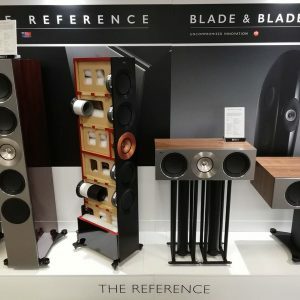 The KEF team proved that their products are more than just stunning aesthetics, demonstrating their speakers’ true capacities to deliver unrivalled sound quality in a listening session that left us all truly dazzled. A thoroughly inspiring and fun day! 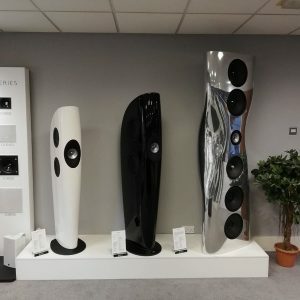 We are planning more KEF tours; if you’re interested in joining us on tour or would like to discuss any of your AV needs, then please give us a call 01622 676703 or click to visit our contact page.